Sometimes, love is so overwhelming that you just have to move your feet. Musicals made me a romantic. They taught me that some emotion is so powerful that it can’t be put into mere words — but rather must be sung. For the youth market, whose patience with dance and song is often limited to the next Beyoncé short form video, a feature length musical is predicted to be a tough sell. But I wouldn’t be so sure with this one. Brilliantly written and directed by 31-year-old Damien Chazelle (Whiplash), La La Land does nothing less than jolt the movie musical to life for the 21st century. It starts with a traffic jam, a sweltering ribbon of frustration on a Los Angeles freeway. All of a sudden, a melody emerges from the squalling of horns and radio stations. The commuters leap from their cars, and a big, brazenly sincere movie-musical song-and-dance number is underway. The glorious songs and score are by Chazelle’s Harvard classmate Justin Hurwitz. It also features wonderful lyrics by Benj Pasek and Justin Paul (repped on Broadway now by the epic Dear Evan Hansen). We’ve had some musicals since the era of Rogers & Astaire. However, few have tried to recapture that sense of magical thinking in which characters communicate with their bodies as much — or even more — than they do with their voices. Instantly, Chazelle’s direction and the dance choreography feels different. Here, and throughout the film, he works in long, unbroken takes. An early verse sung by a chipper young woman in a yellow dress is a kind of overture. It hints at the theme of the bittersweet fairy tale to follow. She recalls leaving her hometown boyfriend behind to pursue fame and fortune here in La La Land — a quaint old nickname for the beautiful Los Angeles. The ingénue in the yellow dress will ultimately vanish from the story, which is concerned with the entwined romantic and creative doings of an actress named Mia (Emma Stone) and a jazz pianist named Sebastian (Ryan Gosling). Mia works at a coffee shop on the Warner Bros lot while waiting to be discovered. She wants to write and star in the kind of non-comic-book entertainments nobody makes any more. Sebastian is a jazz man doing the piano bar thing while waiting for jazz to reemerge as a popular genre. He hopes to open a club in order to play the type of music he wants to play. As Mia and Sebastian get past their hostilities and into frisky flirting, La La Land moves all around its titular town. In the Hollywood Hills, the two sway in time — taking their first steps toward something deeper. Mia and Sebastian soon start to see similarities in one another. Mia is tired of going on worthless auditions, ones in which the producer doesn’t even look up from their phone. Sebastian holds on to an ideal version of jazz, wanting to open his own club instead of selling out and playing greatest hits for tourists. Both Gosling and Stone are fluid, engaged and mesmerizing as we watch them fall in love through dance. Of course, it helps that Gosling and Stone have the kind of star power that made so many of those classic era musicals memorable. This is a story of artistic passion, and how easy it is to get derailed from your dream. Sometimes, it takes another person to push you back on to the tracks to find it again. Gosling and Stone get these characters. There’s a finding grace in their movement but also emotional depth in their arcs. Like a capable bandleader or stage illusionist, Mr. Chazelle knows how to structure a set. The four chapters that track the changing seasons are a sly joke about the weather, which is always perfect. The magical golden hour — that purple-and-orange twilight — seems to last for weeks on end. The Griffith Observatory might as well be heaven itself. The final sequence is one last audition followed by a swirl of rapturous, heart-tugging music and ballet. This scene effectively cashes the check the rest of the movie has written. On first viewing, you may find your delight shadowed by skepticism. Don’t let your head get in the way of your heart. It’s easy to let the world get you down sometimes, especially in the time we’re at now. It’s easy to think that dreams don’t come true, and that love only exists in movies. 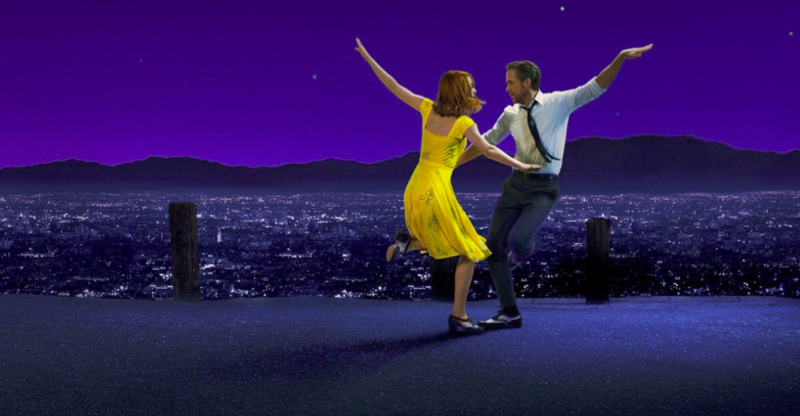 La La Land serves to remind us that movies can still be magical, and they can still provide the channel for us to see magic in the world around us.